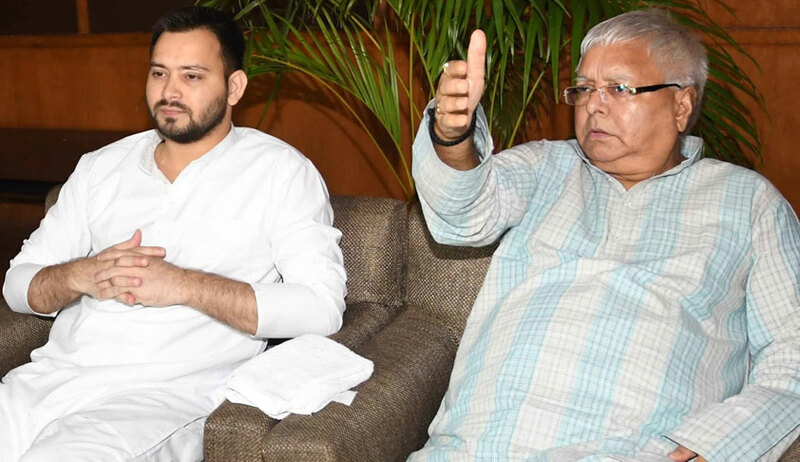 The CBI judge Shiv Pal Singh on Wednesday ordered issue of contempt notice against Lalu’s son Tejaswi Yadav and three other political leaders for making statements before media regarding RJD supremo Lalu Prasad’s conviction. The CBI judge Shiv Pal Singh asked the CBI to serve the notices to them. During a brief proceeding held in connection with fodder scam case (RC 64A.96), the CBI judge expressed displeasure over their statement saying these leaders have been talking a lot on the judgment. Among the other leaders to be served notices are RJD vice-president Raghuvansh Prasad Singh, Shivanand Tiwariand Manish Tiwari. Raghuvansh Prasad Singh was present in the court when the order was issued. He had earlier said ‘Jagannath Mishra to bail, Lalu to jail, wah re Modi ka khel (bail to Jagannath Mishra, jail for LaLu, what a game by Modi). The CBI court postponed the hearing on Lalu Prasad’s sentencing after the lawyers’ body informed that they would be holding a condolence meeting related to demise of two of their members in the afternoon. The hearing in this regard would start from Thursday. Apart from Lalu Prasad, 15 others have been convicted in the fodder scam case (RC64A.96). Lalu has been convicted under sections 120B and 420 of IPC and section 13 (2) of the Prevention of Corruption Act. The court is likely to take up the argument on sentencing of the accused in alphabetical order.